This dish is inspired by one of my favorite pasta places in New York City – Il Corallo Trattoria in Soho. When I went there for the first time, I was blown away by the simplicity but deliciousness of their Capellini Limone. This recipe is meant to recreate the dish at home. While it is not exactly the same, I think that I was able to capture the essence of the dish: clean and fresh flavors, simple, and feels like summer. Marinate shrimps with 1 teaspoon McCormick Montreal Steak Seasoning for 5-10 minutes. Bring a large pot of water to boil, add salt and spaghetti. Cook for 4-5 minutes or follow instructions on the box. Add two tablespoons of olive oil to the pasta and mix well. Heat oil in a skillet over high heat. Add shrimp and cook until the shrimps are opaque. Remove from skillet. In the same skillet, stir in garlic, onion and tomato, cook for a couple minutes. Add pasta and lemon juice, cook for 1-2 minute or until everything cooked through. 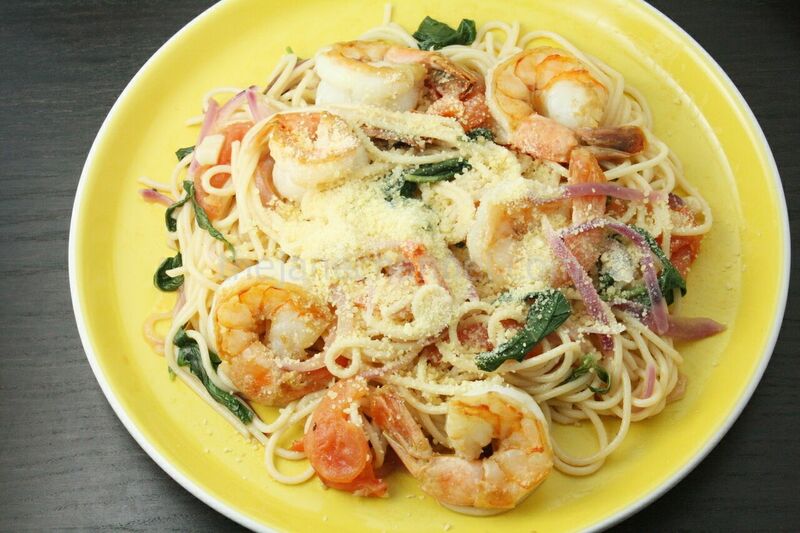 Then add basil and shrimp. Serve with Parmesan cheese, salt and pepper. This recipe was exactly what I was looking for! I am a long time lover of the Capellini Limone from Il Corallo in SoHo. I could eat this dish every day! Being that I live 4 hours away, I was scouring the internet for a recipe that comes as near to this dish as possible to prepare at home. Ironically, the owner of the restaurant is a good friend from high school but I didn’t want her to compromise any culinary secrets. I’m going to try this tomorrow. Thank you!